By default, when new channels are added, the Graph Editor sets them to Edit Mode. And of course you can lock the transformation along the X axis (time frame) or Y axis (value) by pressing X or Y during transformation. For precise control of the keyframe position and value, you can set values in the Active Keyframe of the Properties Region. Ctrl-LMB inserts a keyframe to the active F-Curve at the mouse position. The newly added keyframes will be selected, making it easier to quickly tweak the newly added keyframes. All previously selected keyframes are kept selected by using Shift-Ctrl-LMB. When transforming keyframes with G, R, S, the transformation can be snapped to increments. Divide Transformation by 10.0 Shift. Keyframes can be snapped to different properties by using the Snap Keys tool. Snap the selected keyframes to the Time Cursor. Snap the selected keyframes to the Cursor. Snap the selected keyframes to their nearest frame individually. Snap the selected keyframes to their nearest second individually, based on the FPS of the scene. Snap the selected keyframes to their nearest marker individually. Flatten the Bézier handles for the selected keyframes. Selected keyframes can be mirrored over different properties using the Mirror Keys tool. Acts like the Clean Keyframes tool but will also delete the channel itself if it is only left with a single keyframe containing the default property value and it's not being used by any generative f-curve modifiers or drivers. The modified curve left after the Clean tool is run is not the same as the original, so this tool is better used before doing custom editing of f-curves and after initial keyframe insertion, to get rid of any unwanted keyframes inserted while doing mass keyframe insertion (by selecting all bones and pressing I for instance). There is also an option to smooth the selected curves, but beware: its algorithm seems to be to divide by two the distance between each keyframe and the average linear value of the curve, without any setting, which gives quite a strong smoothing! Note that the first and last keys seem to be never modified by this tool. Sampling a set of keyframes replaces interpolated values with a new keyframe for each frame. 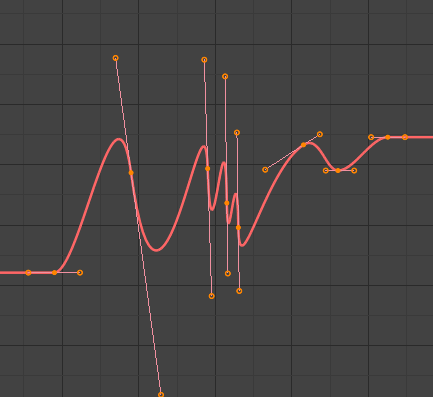 Baking a curve replaces it with a set of sampled points, and removes the ability to edit the curve. 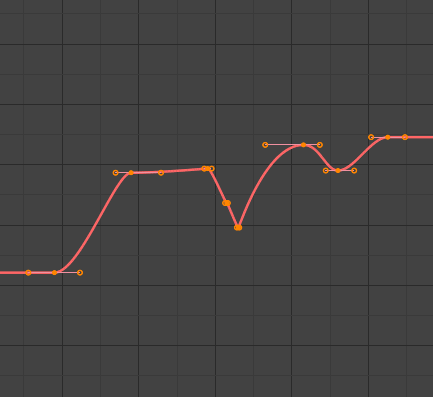 The Bake Sound to F-Curves tool takes a sound file and uses its sound wave to create the animation data. Cutoff frequency of a high-pass filter that is applied to the audio data. Cutoff frequency of a low-pass filter that is applied to the audio data. Value for the hull curve calculation that tells how fast the hull curve can rise. The lower the value the steeper it can rise. Value for the hull curve calculation that tells how fast the hull curve can fall. The lower the value the steeper it can fall. Minimum amplitude value needed to influence the hull curve. Gives the output as a square curve. Negative values always result in -1, and positive ones in 1. All values lower than this threshold result in 0. Show only the selected curve (and hide everything else). Show all previous hidden curves.